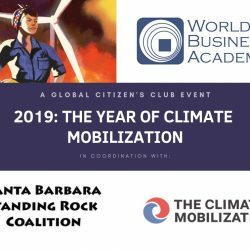 The World Business Academy’s Global Citizens Club is hosting a meeting on Feb. 19 titled, “2019: The Year for Climate Mobilization.” The event features a video statement from Climate Change icon Bill McKibben and a panel discussion with climate activists and local experts discussing grassroots mobilization. Club members and the public are invited to attend this free event, which is co-sponsored by the Santa Barbara Standing Rock Coalition and inaugurates the Santa Barbara chapter of The Climate Mobilization, an organization dedicated to initiating a massive, economy- and society-wide Climate Mobilization to restore a safe climate. Bill McKibben, a prolific author and environmentalist, wrote the 1989 book, “The End of Nature,” which is widely considered an introductory climate change primer for general audiences. He is a founder of 350.org, the first planet-wide, grassroots climate change movement responsible for organizing 20,000 rallies around the world. According to his website (http://billmckibben.com/index.html), McKibben also led the resistance to the Keystone Pipeline and launched the fossil fuel divestment movement. The panel discussion will be moderated by World Business Academy Founder Rinaldo Brutoco and include the following participants: Santa Barbara County Third District Supervisor Joan Hartmann; Margaret Klein Salamon, co-founder of The Climate Mobilization; and Rose Strauss, student leader of the Sunrise Movement at UCSB. Joan Hartmann began her career in academia, serving as Director of the Public Policy Program at the Claremont Graduate School; Assistant Professor of Environmental Studies and Government at Oberlin College; and later as adjunct professor of Environmental Studies at USC. She has also served the public with the Congressional Research Service, the Department of the Interior and the U.S. EPA, Region 3 and helped found the Southern California Wetlands Recovery Project, a novel public-private partnership to restore coastal Southern California rivers and wetlands. Margaret Klein Salamon, PhD is a co-founder and director of The Climate Mobilization. Klein earned her doctorate in clinical psychology from Adelphi University and also holds a BA in Social Anthropology from Harvard. Though she loved her career as a therapist, Margaret felt called to apply her psychological and anthropological knowledge to solving climate change, maintains her blog The Climate Psychologist and has written the numerous papers on Climate Psychology and Movement Strategy. You can also watch this short video to learn more. Rose Strauss is a UCSB Environmental Studies student and climate change activist working to start a local hub of the Sunrise Movement, an organization building an army of young people to make climate change an urgent priority across America. On July 18, 2018, Rose gained notoriety in an exchange with Republican Pennsylvania gubernatorial candidate Scott Wagner, who called her “young and naïve” after she asked him about $200,000 in fossil fuel campaign contributions. Videos of the exchange went viral with the hashtag #YoungAndNaive, and Teen Vogue published an editorial by Ms. Strauss in which she vowed that “young and naïve” voters like herself would be promoting the ouster of politicians who they believe aren’t working for their generation. The World Business Academy formed the Global Citizens Club in late 2017, motivated by the saying, “Think Globally, Act Locally,” as an action incubator to engage local citizens through regular stakeholder meetings and panels addressing crucial social, economic, and environmental issues facing the Santa Barbara area. The GCC offers members a chance to meet others who think of themselves as global citizens and seek to improve the Santa Barbara community. The Feb. 19 meeting takes place from 5-7 p.m. in the Riviera Ballroom of the Belmond El Encanto Hotel & Spa, located at 800 Alvarado Place in Santa Barbara. RSVP at Eventbrite to reserve a seat at this free event. Call (805) 892-4600 or e-mail [email protected] for details or questions. Visit www.worldbusiness.org.